Boys 50-yard freestyle—Ty Hearron 2nd, Sam Sloan 37th, Jacob Elliott 54th, Sam Brown 65th, and James Hang 84th out of 102 swimmers. Girls 50-yard freestyle—Hannah Harvill 35th out of 104 swimmers. Boys 100-yard freestyle—Ty Hearron 2nd, Sam Brown 31st, and James Hang 47th out of 51swimmers. Girls 100-yard freestyle—Isabella Greco 18th and Makayla Houchin 22nd out of 60 swimmers. Girls 100-yard butterfly—Makayla Houchin 3rd and Hannah Harvill 13th out of 21swimmers. Girls 100- yard backstroke—Isabella Greco 15th out of 47 swimmers. Boys 100-yard breaststroke—Jacob Elliott 26th and Sam Sloan 31st out of 40 swimmers. Boys 220-yard medley relay—8th place out of 24 teams (Ryan Sharp, Jacob Elliott, Ty Hearron, Sam Sloan). Boys 200-yard freestyle relay—9th place out of 27 teams (Ryan Sharp, Jacob Elliott, Ty Hearron, Sam Sloan). 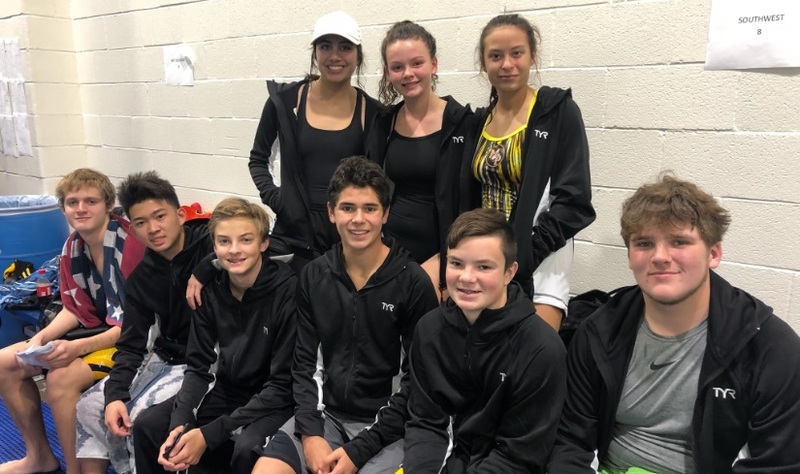 The Tiger Swimmers compete again this Friday, November 16, in Texarkana. The top 16 swimmers in each event will advance to the finals on Saturday, November 17. 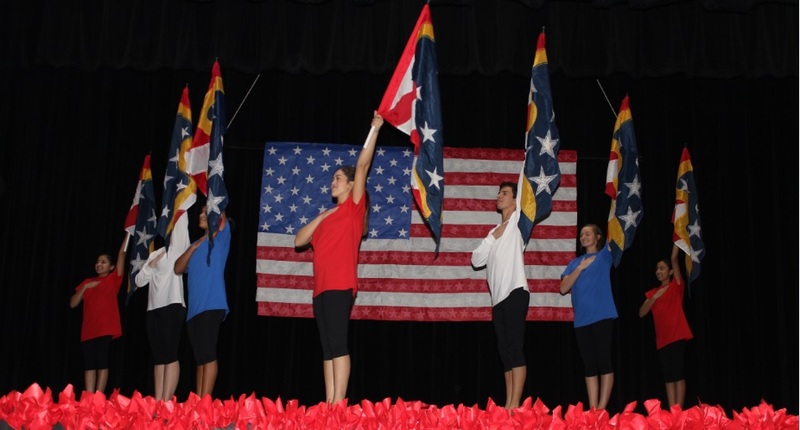 Colorguard photo: The MPHS Colorguard officers perform for the veterans. Andrews Sisters: L to R–Zena Lawrence, Tracie Johnson, Shonda Randle, Deanna Warren, Nan Verner. Wallace Middle School Hosts 21st Annual Veterans’ Day Program. Military Veterans and their families filled tables on the floor of the P.E. Wallace Middle School Gym while students and staff filled the stands in colored shirts that represented the flag of the United States on Thursday, November 8 as Wallace presented their 21st annual Veterans Day Program. 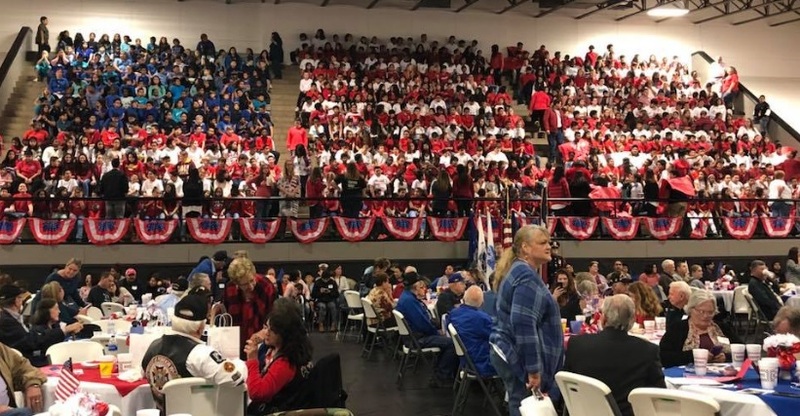 Started 21 years ago by then principal Rodney Huffman and teachers Jana Milam and Vicki Sinclair, the program was created to fulfill two purposes: to honor military veterans and to help Wallace students understand the role and sacrifices of the those who serve in the military. Mr. Sid Serres gave this year’s Veterans address. Serres gave the Veterans speech at the very first Wallace program 21 years ago. Wallace students and staff were proud to welcome him back to the campus. 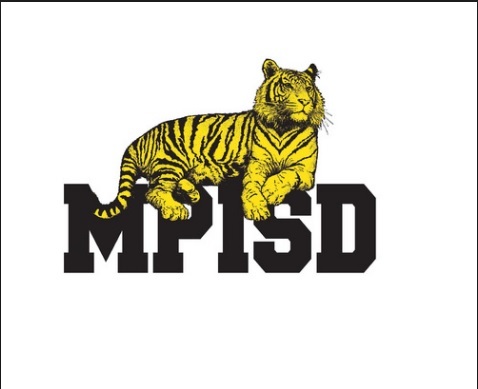 The program was full of music: the MPHS Jazz Band, the Wallace 5th and 6th Grade Choirs, the “Andrews Sisters” (Tracie Johnson, Zena Lawrence, Shonda Randle, Nan Verner, Deanna Warren and Diane Swiger on the Piano), and solos by Landon Johnson, Karen Luckett, and Vicki Sinclair. Tim Ervin played “Reveille” and “Taps” to open and close the program. The Mt. 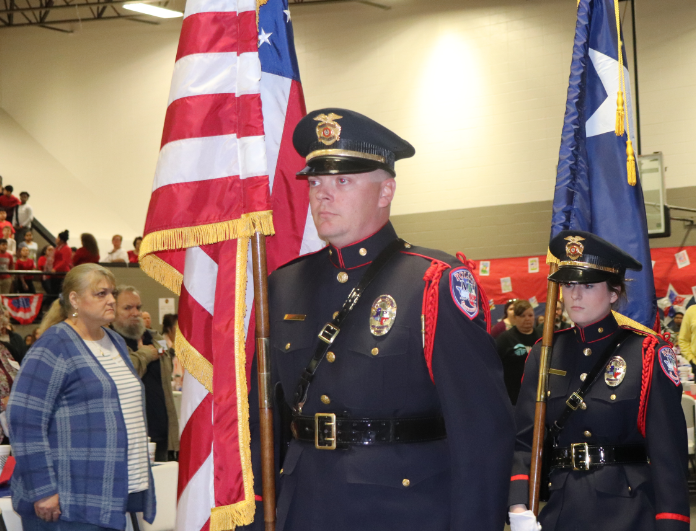 Pleasant Police Department posted and retrieved the American and Texas flags, while Wallace students presented the military branch flags and, finally, the POW-MIA flag which a moment of silence accompanied. Honored were military widows, active military members, World War II veterans and recipients of military awards for Valor and Purple Hearts. Wallace students read the names of Titus County residents who had served in World War I.
Sixth-grade student Emely Chavelas read her Pilot Club award-winning essay, “I’m Proud to be an American.” Pilot Club member Becky Meriwether presented Chavelas a certificate for writing the moving article. Living flag photo: P.E. Wallace Middle School students form a flag in the stands. 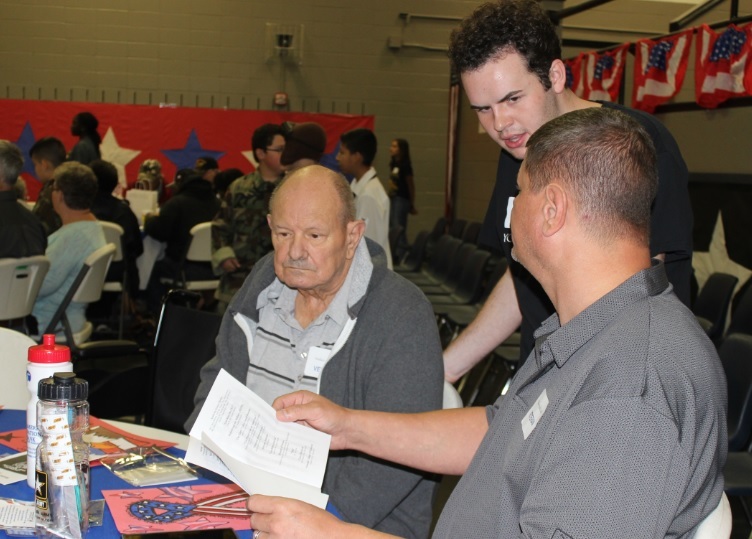 FBLA senior Matthew Armstrong serves veterans at the program. 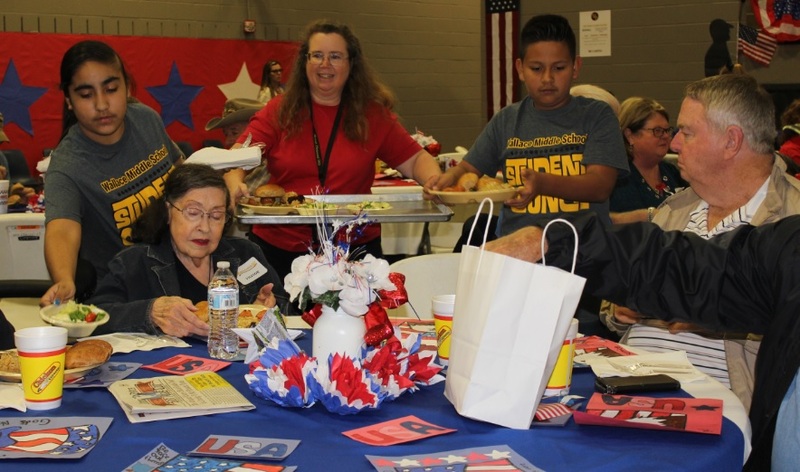 Wallace teacher Tara Flores and two members of the Wallace Student Council help serve veterans at lunch. Fifth Grade: Brissa Alvarez, Alberto Avila, Lucero Ayala, Valerie Cassio, Carter Cook, Cristian Cordova Hernandez, Ernest DeLaRosa Cordona, Aaliyah Delarosa, Lyric Doddy, Javan Garcia, Jamie Garrett, Alessandro Greco, Alegandro Guerrero, Claire Muskrat, Jaqueline Pena, Esmeralda Perez, Ailin Quinonez, Alondra Ruiz Lara, Alondra Santos, Iza-Bella Sharbeno, Andrew Simmons, Chloe Simmons, Matthew St. John, Kortland Stovall, Wendy Valdez, Angel Vazquez, Nathan Zavala. Sixth Grade: Rachel Albin, Ashlin Arrington, Katherine Ball, Jeffrey Bond, Elizabeth Buck, Samuel Chappell, Emely Chavelas, Selena Clark, Evan Cota, David Cumpian, Diya Desai, Donavyn Gafford, Jose Gonzalez, Patricia Gonzalez, Addison Heeren, Bek Hernandez, Hayden Hester, Skyler Hopkins, Heissel Jaimes, William Johnson, Melanie Logue, Kinley Lowry, Dori Macedo, Tanner Marshall, Amir Martinez, James Means, Kevin Mendoza, Eunice Mendoza Garcia, Brayden Middleton, Rane Miller, Jeseth Monreal, Jesus Moreno, Rolston Morton, Andrew Murray McKaylie Nixon, Ayden Osterdock, Alayza Police, Carlos Reyes, Noelia Robles, Francisco Rodriguez Jr., Christian Sanchez, Alexander Sandate, Jayani Shannon, Chloe Snodgrass, Katelyn Tejeda, Hayden Tennison, Katherine Thompson, Luke Thurman, Diego Ugalde, Johnathan Ventura.